When most people think of an American Indian headdress, the first image that comes to mind is a full eagle-feather warbonnet like the Lakota Sioux headdress above. 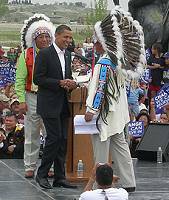 But in fact, American Indians in most tribes never used feather headdresses like these. Feathered warbonnets may be the best-known American Indian headdresses, but they were not the most commonly used-- and they were certainly not the only ones. Read on for pictures and descriptions of the most important Native American headdress styles of North America and the differences between them. Warbonnets (or war bonnets) are the impressive feather headdresses commonly seen in Western movies and TV shows. Although warbonnets are the best-known type of Indian headdress today, they were actually only worn by a dozen or so Indian tribes in the Great Plains region, such as the Sioux, Crow, Blackfeet, Cheyenne, and Plains Cree. In the first photograph, you can see a Dakota Sioux warrior wearing a trailer warbonnet (native headdress with single or double rows of eagle feathers descending in a long 'tail' all the way to the ground). In the second photo, modern Crow elders attend a formal event in halo warbonnets (native headdresses with eagle feathers fanned out around the face in an oval shape). 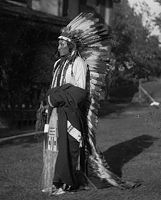 The third photograph shows a Blackfoot man wearing a straight-up feather headdress (taller, narrower headdresses where the eagle feathers stand up straight.) 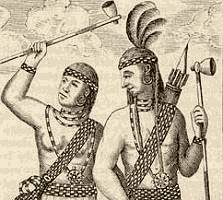 All three types of Indian war bonnets were made from the tail feathers of the golden eagle, and each feather had to be earned by an act of bravery. Sometimes a feather might be painted with red dye to commemorate a particular deed. Besides the feathers, Plains Indian warbonnets were often decorated with ermine skins and fancy beadwork. Native American warbonnets were important ceremonial regalia worn only by chiefs and warriors. Also, only men wore warbonnets. (Women sometimes went to war in some Plains Indian tribes, and there were even some female chiefs, but they never wore these masculine headdresses.) Plains Indian men occasionally wore warbonnet headdresses while they were fighting, but more often they wore roach headdresses into battle (see below) and saved their war bonnets for formal occasions. In particular, long feather trailers were never worn on the battlefield. It would be impossible to fight while wearing them! 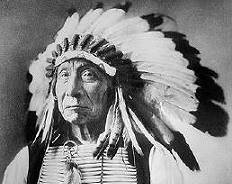 In the 1800's, Native American men from other tribes sometimes began to wear Plains-style warbonnets. Partially this was because of the American tourist industry, which expected Native Americans to look a certain way. Partially it was because many Native American tribes were forced to move to Oklahoma and other Indian territories during this time in history, so tribes that used to live far apart began adopting customs from their new neighbors. In most cases, the feather warbonnet did not have the same significance among the new tribes that adopted it. For them, wearing a feathered headdress was a matter of fashion or a general symbol of authority. But for the Plains Indian tribes, feather warbonnets were a sacred display of a man's honor and courage, and each feather told a story. Eagle feathers are still sometimes awarded to Plains Indians who serve in the military or do other brave deeds today. 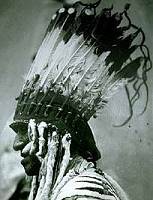 Feather warbonnets are better-known to popular culture, but roach headdresses (also called porcupine roaches or artificial roaches) were the most widely used kind of Indian headdress in the United States. Most Native American tribes east of the Rocky Mountains were familiar with some form of roach headdress. These native headdresses are made of stiff animal hair, especially porcupine guard hair, moose hair, and deer's tail hair. This hair was attached to a bone hair ornament or leather base so that it stood straight up from the head like a tuft or crest. Often the hair was dyed bright colors and feathers, shells, or other decorations were attached. 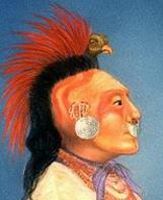 In some tribes, men wore their hair in a scalplock or crested roach style (frequently given the name Mohawk or Mohican after two tribes in which roached hair was common), and the artificial roach was attached to the man's own hair. The Caddo man in the first picture is wearing his roach headdress this way. In other tribes, porcupine roaches were attached to leather headbands or thongs and worn over long hair or braids. This is how they are most commonly worn today. Roach headdresses were usually worn by warriors and dancers. Like war-bonnets, the porcupine hair roach is traditionally men's headwear, not worn even by female warriors. Their use varied from tribe to tribe. 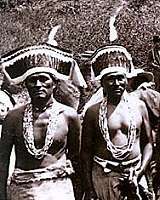 In many tribes, roaches were worn into battle, while more formal tribal headdresses (like warbonnets, otter-fur turbans, or gustowah caps) were worn to ceremonial events. In other tribes, roaches were worn primarily as dance regalia or sports costume. In some tribes, individual men chose to wear porcupine roaches while other men did not. Like other clothing styles, roaches sometimes went into and out of fashion. They were not generally as spiritually meaningful as Native American warbonnet headdresses, though a boy earning the right to wear a roach for the first time was an important ceremony in some tribes. Today, porcupine roaches can be commonly seen at powwows, where they are still worn as regalia by male dancers from many different tribes. Basket hats (also known as twined caps or basketry hats) were the most common type of Native American headdress west of the Rocky Mountains. Different tribes made basket hats in different shapes and styles. 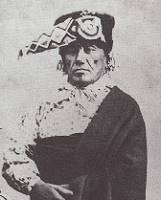 California Indian tribes usually made small rounded or fez-shaped basket caps from tightly coiled sumac, like the Hupa Indian hat below. Northwest Coast tribes like the Haida and Salish often made larger hats in more conical or brimmed shapes from fibers such as cedar bark or spruce root. 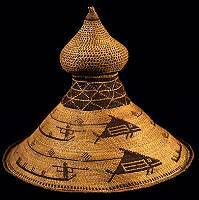 In California and the Plateau tribes, basket hats were normally worn only by women and girls, and their designs were mostly decorative. 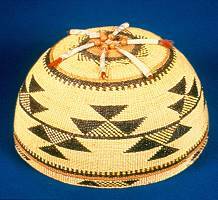 On the Northwest Coast, both men and women wore basketry headgear, for dance regalia and ceremonial purposes as well as everyday life. 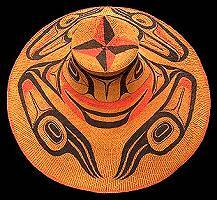 Northwest Coast basket hat designs often conveyed information about a person's clan, achievements, or status within the tribe. The Indian headband is also well-known from movies and other popular images of Native Americans. However, this style of headband was typically only used by a few tribes of the northeast Woodlands. Usually the headband consisted of a finger-woven or beaded deerskin strip with tribal designs on it. This band was then tied around the brow with a feather or two tucked through the back. 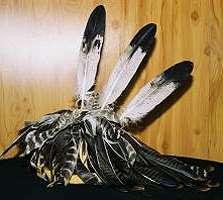 Not only eagle feathers but turkey, hawk, egret, and crane feathers were also used for Woodland Indian headbands. Unlike many of the Native American headdresses on this page, both men and women wore headbands, which were not associated with war. The number and type of feather did not usually have special symbolic meaning, though in a few tribes that bordered the Plains eagle feathers were reserved for warriors. For the most part, Woodland Indian head bands were worn for their beauty, and were often decorated with intricate patterns, wampum, beads, and quillwork. 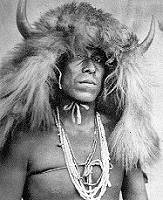 Like feather war bonnets, buffalo horn headdresses were traditional regalia of certain Plains Indian warriors. 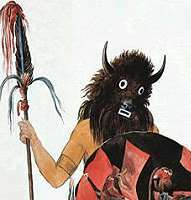 These were helmets of buffalo hide with a pair of buffalo horns attached, frequently adorned with shaggy buffalo fur and a buffalo tail trailing behind. 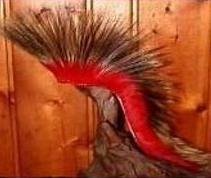 In many cases ermineskins and war feathers were hung from the headdress, as in the second picture. 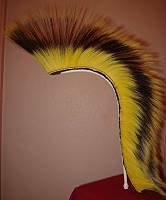 Sometimes a horned headdress was even combined with a feather trail, as in the third picture. The spiritual and ceremonial importance of horned headdresses to the Plains Indians was similar to that of feathered warbonnets. Only distinguished male warriors wore this sacred kind of regalia. 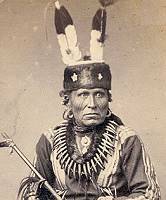 Horned headdresses were rarer than eagle-feather warbonnets, because they were used by fewer tribes (only the Sioux and a few other tribes of the northern Plains wore this kind of headdress) and also because only warriors of certain clans or who had accomplished specific deeds wore bison horns. Otter-fur turbans (also known as otter-skin caps) are ceremonial headdresses worn by men in certain Prairie and Southern Plains tribes, such as the Potawatomi, Pawnee and Osage. These are round hats made of otter fur with the otter's tail either hanging behind or jutting out to one side in a beaded sheath. The turbans and tail sheaths were often elaborately decorated with beaded and painted designs symbolizing the owner's war honors, and a chief and his descendants usually attach eagle feathers to the back of their turbans. Otter-skin turbans were formal head dresses with great symbolic importance. They were worn at ceremonies or other solemn occasions, not by warriors entering battle (who usually wore porcupine roaches.) Even today, otter-fur caps are sometimes worn at formal events by Southern Plains Indian men. 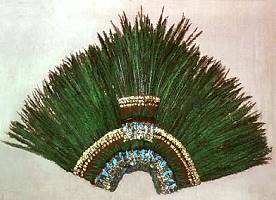 The Aztec and Highland Maya Indians of Mexico were also famous for their feather headdresses, but these headdresses looked very different from the Plains Indian warbonnets. To make their native headdresses, the Aztecs and Mayans sewed together a large fan of feathers and then attached it to the back of their head with straps and a headband or metal circlet. Another difference is that parrot, macaw, and quetzal feathers were used instead of eagle feathers. 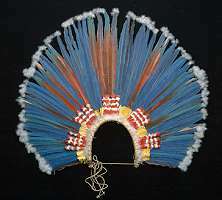 This style of Indian feather headdress was not only popular in Mexico but also in Central America and in parts of South America as far south as Brazil. Both men and women wore Indian headdresses like these. They didn't have any connection to war, but in the Aztec Empire, the fanciest ones (adorned with gold, jewels, and jade stone) symbolized nobility. Today, feather-fan headdresses are worn as regalia by Nahua, Mayan, and other native dancers in Mexico and Guatemala, and colorful headdresses modelled on traditional Brazilian Indian ones are worn as costumes for Mardi Gras Carnival in Rio de Janeiro every year. 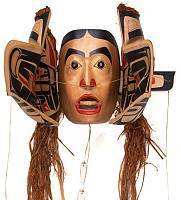 Masks are another kind of headgear used by many Native American tribes from Alaska to Argentina. In most tribes, masks are used for religious rituals or festivals, but there are nearly as many different American Indian mask-making traditions as there are American Indian tribes. We have a separate page of Native American masks that you may like to visit to learn more about the diversity of tribal masks, but here are photographs of a few of the most common types. Plains Indians typically crafted simple animal masks from the heads or skulls of important animals such as the buffalo bull, bear or wolf. 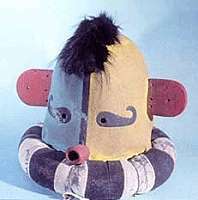 Most tribes carved masks from wood and decorated them with leather and fur, like the Hopi kachina dance mask below. In some of the northwestern tribes, mask makers carved particularly complex hinged transformation masks that opened when a cord was pulled to reveal a second face within the first one. 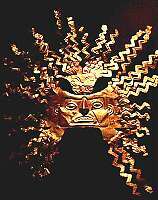 Metal masks were rare in North America but some South American tribes, like the Inca tribe, created beautiful beaten gold and silver masks. And in some eastern tribes like the Seneca and Tuscarora tribes, making false face masks is considered such a sacred ritual that no one is allowed to take photographs of them. 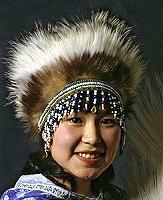 The gustoweh cap is a formal feathered skullcap used only by men from the Iroquois tribes. The big eagle feathers on top of the cap were symbols that showed which specific tribe an Iroquois man belonged to. (The three straight feathers on the cap in this picture mean that the owner is Mohawk.) 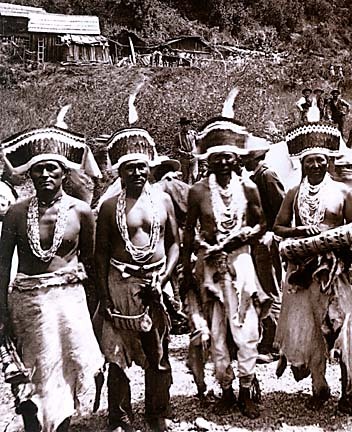 In some northern California tribes, men wore flicker headdresses as dance regalia. These California Indian headdresses are made of wide leather strips decorated with the red scalps of woodpeckers. 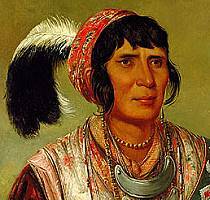 During the 1800's when cloth became more readily available, cloth turbans decorated with feathers became stylish among Cherokee, Seminoles and other southeastern Indian men, and cloth headbands became everyday wear for men from the Navajo, Apache, and Pueblo tribes. Iroquois ladies often wore a distinctive tiara style of beaded headband. This high crown-like headdress is still used at formal events today. 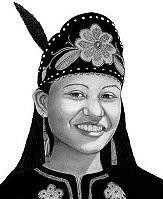 Wabanaki women in Maine and New Brunswick sometimes wore peaked caps with a floral bead design. 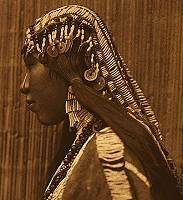 In many Plateau tribes, brides wore elaborate beaded head coverings like the Wishram woman above, crafted from dentalium shells, abalone, and other precious materials. The Eskimo people (Inuit, Aleut, and Yupik) did not normally wear headdresses, but women did use headbands with long fringes, sometimes ringed with caribou fur like the one in this picture, as dance regalia. Did Native American children wear the headdresses on this page? 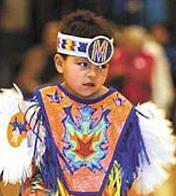 Today, Native American children often wear ethnic dance headdresses at powwows and other cultural festivals. The most common are beaded headbands like the one this Ho-Chunk child is wearing. But in some tribes, even young children wear Indian roaches as dance regalia today. Was there a special kind of Indian headdress used by princesses? Mayan queens headdress Not in the tribes of the U.S. or Canada. Almost none of these tribes had royalty the way Europeans did-- a chief's daughter was more like a general's daughter or a governor's daughter than a princess, and she did not wear a crown or other special clothing. Many Mexican Indian tribes had royal families, however. The wives, sisters, and daughters of Mexican Indian kings and emperors wore feather headdresses adorned with gold, jade, and jewels just like the male members of their families did. 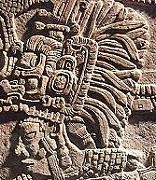 This is a stone carving of a Mayan queen wearing a royal feather headdress. Is it true that Aztec and Mayan headdresses resemble the headdresses of Egyptian pharaohs? Aztec headdress Egyptian headdress No, this is false. Probably this rumor got started because the Aztecs and Mayas, like the ancient Egyptians, built pyramids. But their headdresses have nothing in common at all. 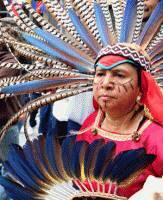 As you can see here, Aztec and Maya Indians wore large fan-shaped feather headdresses. Egyptian headdresses were made of draped cloth or of a reed frame with cloth stretched over it into a high crown shape. Here is an extensive website where you can see the different kinds of Egyptian crowns and headdresses. They didn't look anything like the Aztec and Maya ones. Where can I buy a Native American headdress or find instructions to make my own? Porky roach for sale On our Native American regalia page, you can find links to tribal members who make dance roaches and other ceremonial Indian clothing. A good place to buy kits for making your own porky roaches or other dance accessories is the well-known pow-wow vendor Crazy Crow. If you are not Native American but are just trying to make a native headdress for an art project, we recommend making a beaded headband, since headbands do not have the same sacred meaning of many other Native American Indian headdresses and do not require you to understand complex cultural traditions to create one properly. The book North American Indian Beadwork Patterns includes a nice pattern for beading a Native American headband. A good book about clothing and regalia in different tribes, including native headdress styles. Detailed book about the history and importance of the Native American war bonnet. Another book about Plains Indian feather headdresses. Beautiful photographic book of powwow regalia, including dance roaches and other Indian headdresses. 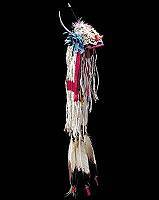 Online museum exhibit of American Indian headdresses from North, Central, and South America. History and construction of roach headdresses, with many old photographs. 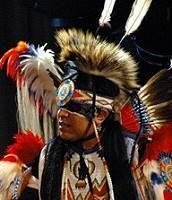 Powwow picture galleries, displaying the native headdress and other regalia of the dancers. Native American Indian headdresses for sale online by tribal artists.